Thank you, Dr Garcia for improving my life and my smile. Due to the ravages of chemotherapy in 2001, I was plagued with loose teeth, abscesses, etc. Upon recommendation from a friend, I went to see Dr. Gracia After trying many maintenance options, I realized I only had a few choices ahead of me, which I discussed with Dr. Gracia, one of them being dental implants. With natural reservation, I proceeded with Dr. Gracia's guidance and understanding. They journey posed its share if challenges, of which Dr. Gracia and his incredible staff guided and assisted me along the way. Minor setbacks were met the professionalism, kindess and immediate resolution. I cannot express, in so many words, how happy I am with Dr. Gracia, his staff and lab technician, for giving me the chance to smile again. Advanced Dental Care of Norton is above excellent, in my opinion, and I would recommend them to anyone for any procedure. "I wish to express my appreciation for restoring my mouth. I can now enjoy ALL foods. You accomplished something other dentists couldn't. The procedure was painless! You are not only a caring doctor but you are a "Gentle Genius." I'm forever grateful!" "Thanks so much for the new tooth you gave me in May. I couldn't have imagined how profoundly it would affect my whole attitude & increase my confidence! I'm not bashful when I smile anymore and I actually look into people's eyes when I smile- a great step for me! Thank you so much, if it wasn't for all of you, I wouldn't have been able to afford the tooth!" 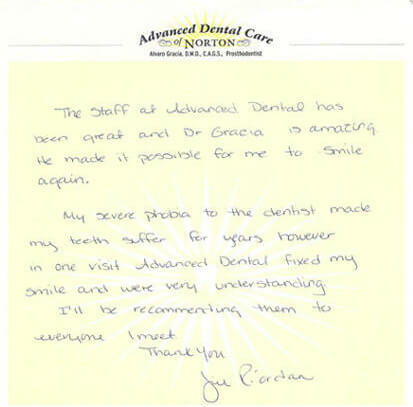 "Dr. Gracia has recently taken on my difficult dental history. He's done wonders for my teeth and has reduced my visits, which is great for me but bad for the practice!" I am very pleased with the oral appliance! It really works--no more snoring! I tried the CPAP system off-and-on for over two years because I was really concerned with the health problems associated with sleep apnea. Unfortunately, with the CPAP, I constantly had eye and nose irritations. Air would expel and dry my eyes. I would always wake up because the hose got tangled. ALso, it was upsetting to wake up with marks on my face due to the mask. The oral appliance is comfortable, easy to use and keep clean. Also, it is convenient to bring when I am travelling on business and vacation because I don't have to worry if there will be an electric outlet near the bed. 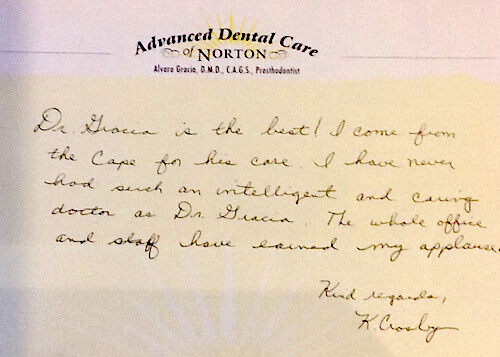 The professional and personal care I received from Dr. Gracia and the staff at Advanced Dental of Norton was excellent. They were wonderful during the whole process--from the initial consultation, teh fitting, the training, and follow-up visits. I highly recommend the oral appliance and especially Dr. Gracia. A patient of Dr. Gracia who wishes to remain anonymous. "I've always been a coward about going to the dentist, but now I don't give it a second thought. I know the doctors will explain all the procedures and make me feel comfortable." Always a great experience! Friendly and knowledge staff. Thank you for taking such good care of my son. Honestly the BEST!!! Jen is beyond AMAZING! My teeth are so sparkly. Anytime I am washing my hands, I find that I am smiling in the mirror just to admire my teeth! Take it from someone who has lived with crazy amounts of anxiety about the dentist, THIS is the place to go!! Thank you Jen for giving me my smile back :) Looking forward to seeing you in 6 months! "I came to ADC hoping for a natural-looking smile that hid all the imperfections and wear my teeth showed, without false teeth or drastic implants. Dr. Gracia laid out a plan that included all the variable costs up front, so there would be no surprises. I found I not only wanted to start the program as soon as possible, but through a pre-payment plan I would receive a discount for the procedures! Now the smile I had 25 years is ago back." 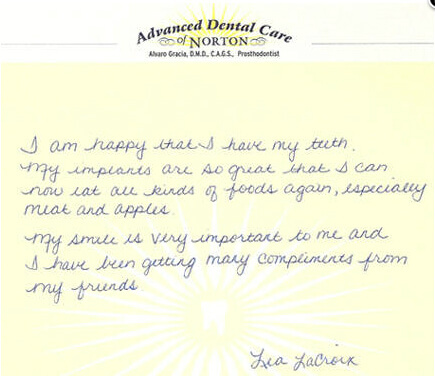 "Advanced Dental Care has been an excellent experience. I would recommend their services and staff to all my friends." I have a severe phobia of going to the dentist. I cracked my tooth on a bone so I HAD to go. I heard great things about this dental office. So I went and was blown away by the compassion my hygienist Heather had. Dr Garcia as well. Completly non judgmental and understanding of the anxiety I was feeling. Literally angels from dental heaven. You will be in good hands. 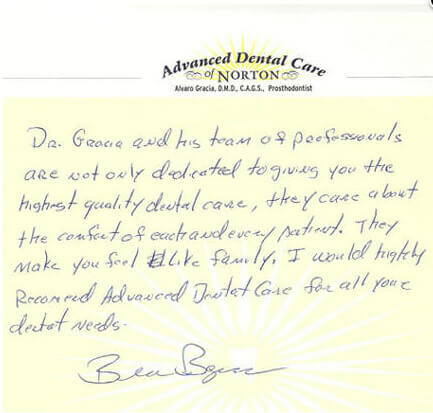 What can I say..... Advanced Dental Care they are the best dental office. Dr. Garcia's and his team are amazing. I have been a patient for several years and they always go above and beyond to make you feel comfortable. They are the friendliest staff and always answer all my questions and have gotten me an appointment ASAP when I needed it. I would highly recommend Dr Garcia and his office as they have always done an outstanding job. Dr. Garcia is so awesome at making you feel better and telling you it’s ok we will fix this. Angela has been amazing and making me feel comfortable with all of the dental work I’ve had done. And as for Santana..... my new smile is absolutely beautiful. What a great experience i had. From the staff to the way i was cared, im incredibly happy with the results of my implants. I strongly recommend this office for dental care.